Staying around the Bay Area this holiday week? Looking for something to do with kids that doesn’t involve shopping on Friday morning? 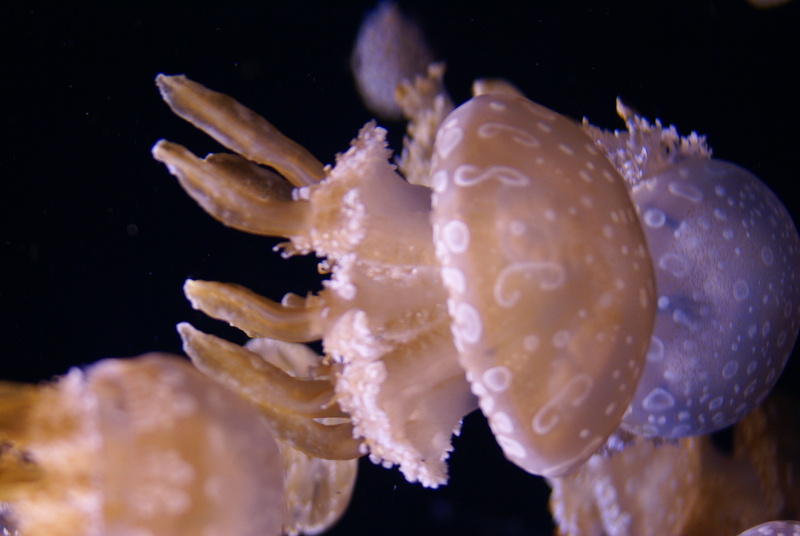 Why not take a trip to the Monterey Bay Aquarium? The aquarium is located in beautiful Monterey, CA on historic Cannery Row. The street itself has many fun shops and restaurants, as well as beach access (if you are brave enough to sit in the cold!) The Monterey Bay Aquarium offers plenty of activities for everyone in the family. 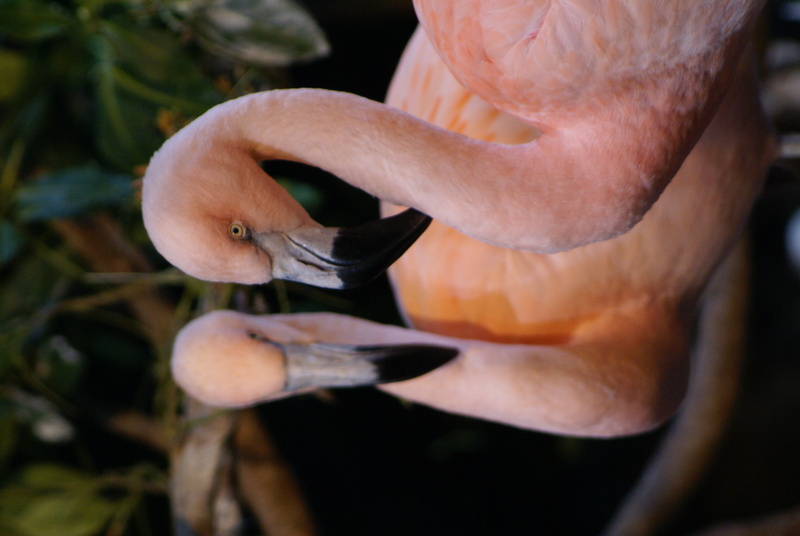 You can watch daily animal feedings, watch live presentations with some of the animals, visit the tidepools and touch some of the wildlife and more. 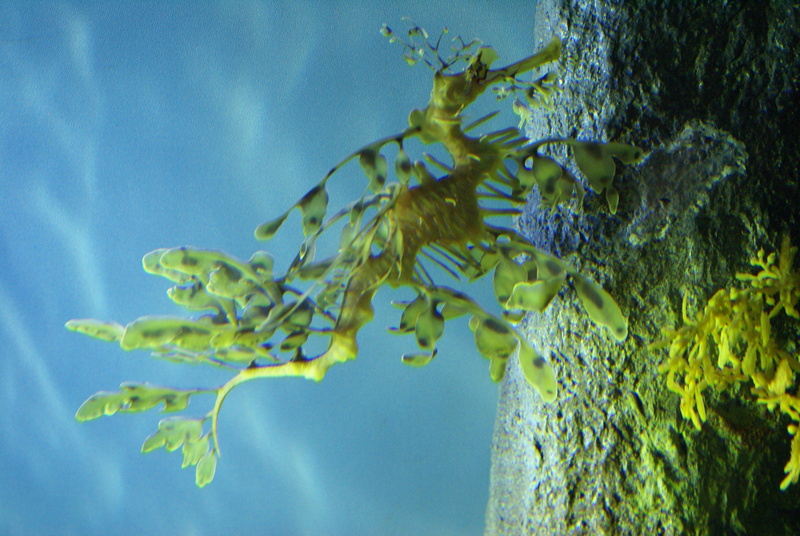 The new exhibit at the aquarium is amazing as well – The Secret Lives of Seahorses. The variety of seahorses and sea dragons is amazing in and of itself, and watching the creatures move about their tanks is fascinating. So even though it is a bit of a drive down to Monterey, it is well worth the trip. The aquarium is still one of my favorite places to visit, and if you still want to get in a little holiday shopping, the stores on Cannery Row are sure to have something you’ll enjoy. (All photos taken by Mary Ayers). During this 1-and-half-day fun-packed camp, kids learned about how their library works for them and where to find homework resources, discovered cool Internet websites and how to keep themselves safe, enjoyed very interesting booktalks, had a very tense and exciting Jeopardy game, and made creative paper-weaving crafts. Watch more videos of our fun moments on Centerville Library’s Facebook or YouTube Channel. 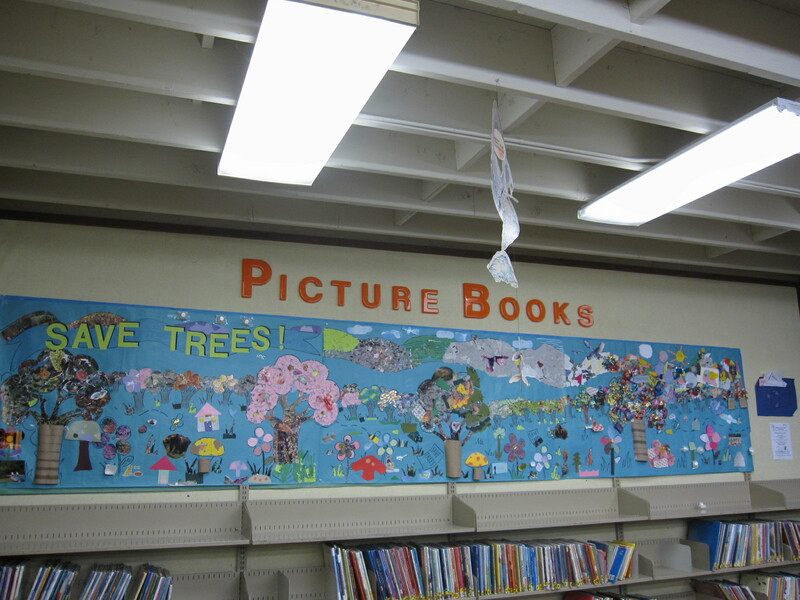 Check Out the Tree Collage at Centerville Library! As part of the Art IS Education 2011 program, Centerville Library’s kids and teens were busy having fun creating their collage trees in March. 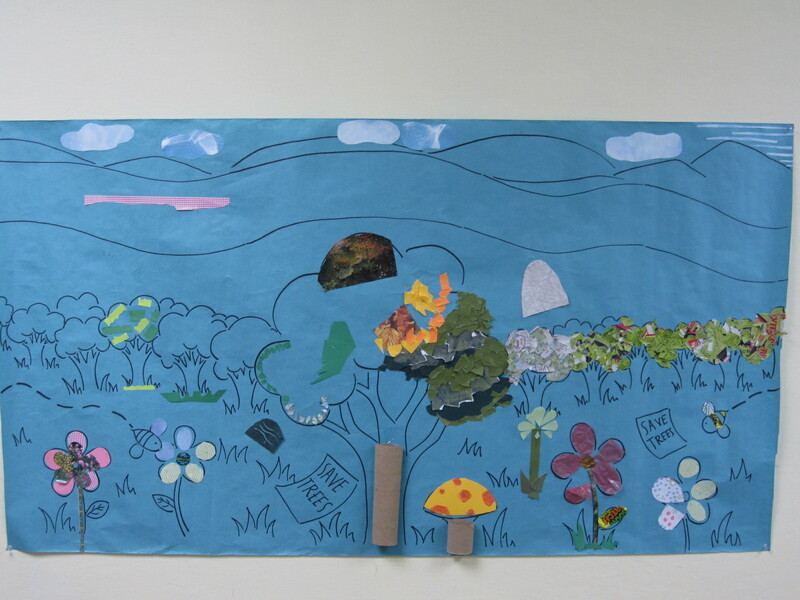 This 20 x 4 ft. art project is now completed and on display in the Children’s Area in celebration of this year’s theme—“Creating Solutions for the World We Share.” Excellent job done! Come check it out, it’s beautiful! 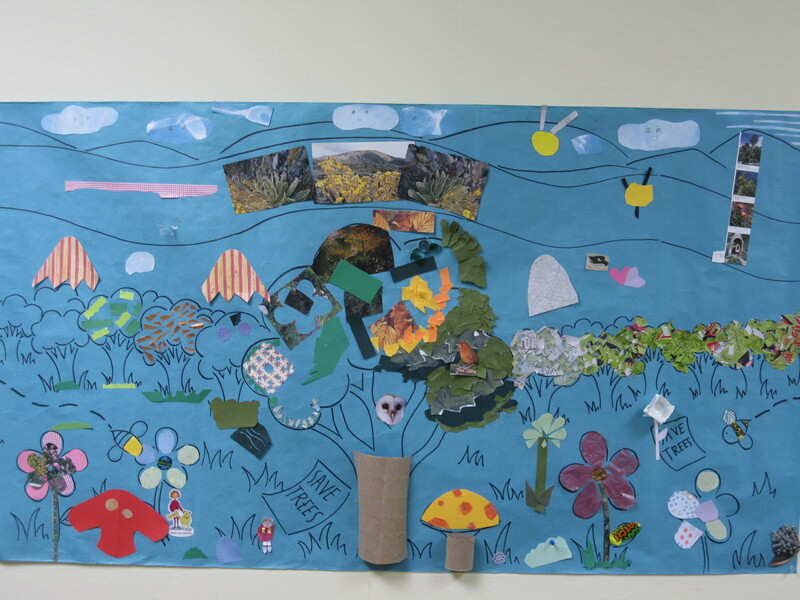 As part of our Art is Education program we are creating a collage art project made from recycled materials at the Centerville Library. 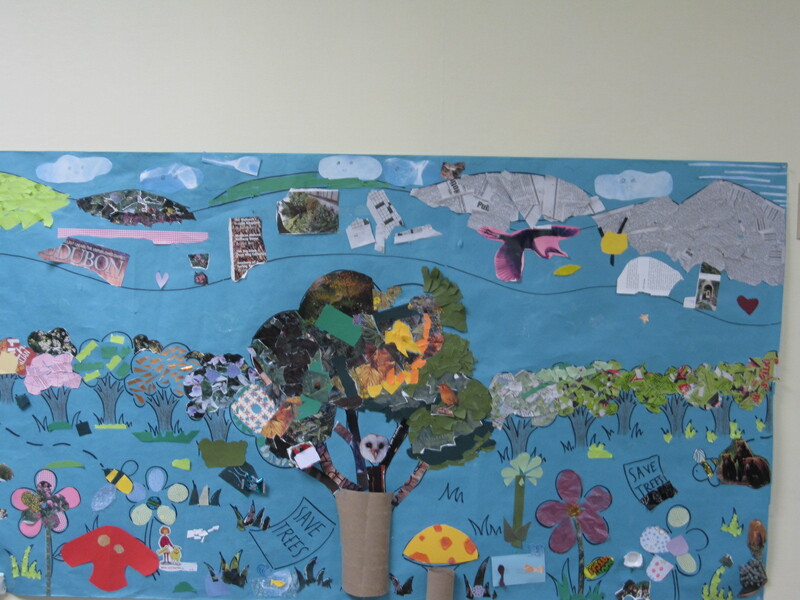 Check out the progress so far on our Create a Tree Collage. It is looking good! We still have quite a bit of work to do. So if you like to recycle, have an artistic flair, or just want to be part of a collaborative art project drop by Centerville Library and have some fun! 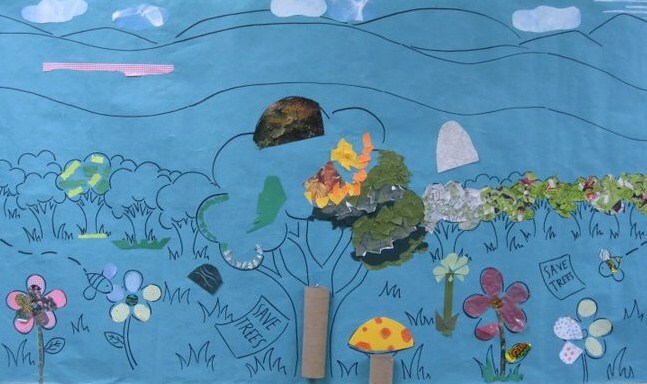 This collage project is open to everyone and all materials are provided. Lots are happening at Centerville Library in March! Besides two on-going reading programs–Read-With-Me and Read-To-Me, and the monthly Kids Book Club and Mandarin Parenting Class, we are also offering three special programs to make this month a very eventful one. *Click on the picture on the left to see the program flyer. Time: Click on the picture on the left for public participation hours. 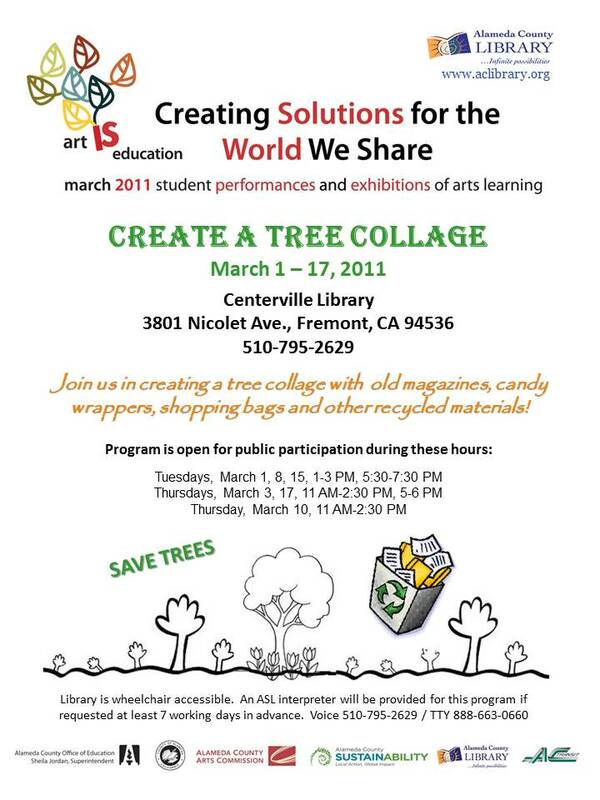 As part of the Art IS Education, an annual showcase of youth arts learning in Alameda County, kids, teens and their family are invited to stop by Centerville Library to create tree collages with old magazines, candy wrappers, shopping bags and other recycled materials. After it’s completed, the 3′ X 15′ project will be on display in the Children’s Area to honor this year’s theme–“Creating Soluntions for the World We Share”. Day: March 1 – April 26, 2 P.M. The popular Library Bucks are back! 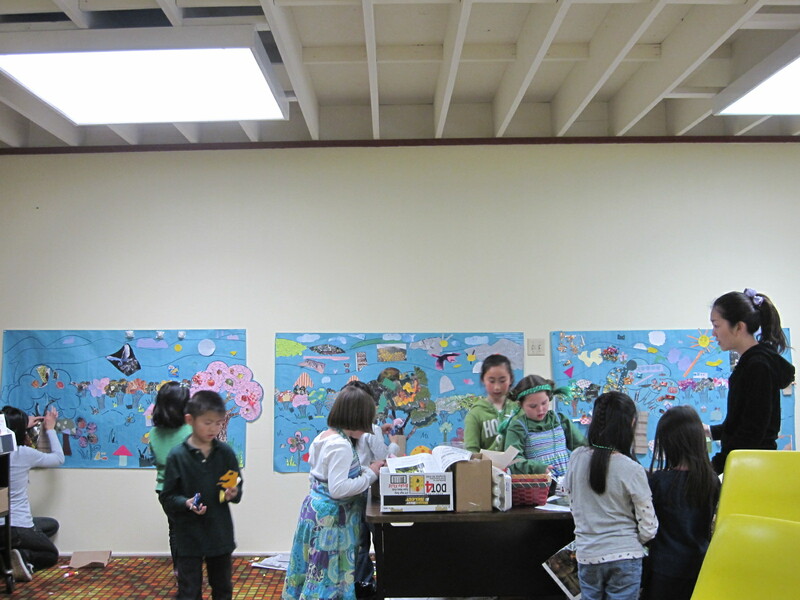 Kids read library books to earn Library Bucks. The more your read, the more Library Bucks you earn! 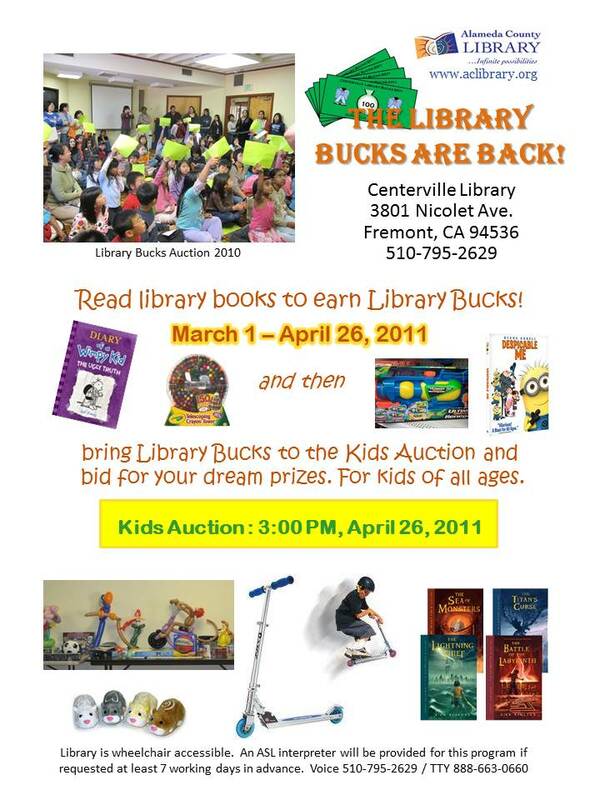 The more Library Bucks you earn, the better chances to win your dream prizes at the Kids Auction! The auction is scheduled at 3:00 P.M. on April 26, 2011. Small items will be for sale after the auction. A balloon artist will also be onsite making balloon figures for you to purchase. All sales are Library Bucks only. Pick up a reading log and start reading, there’s no time to wait! *To watch a video of last year’s auction, click HERE. Join us for the fun of making a colorful wallet entirely out of ordinary duct tape! Supplies and materials are provided. Seats are limited, a free ticket is required to attend. Tickets are available beginning at 6:00 pm at the Information Desk. Happy New Year from Centerville Library! Click on the present to see what’s inside! Many of the pictures in this multimedia poster have a link to the video of the event. Click on some of them and enjoy! Click HERE to download a complete summer programs flyer. Tuesday, June 23, 1:30-5:30 P.M.
Thursday, June 25, 10:00 A.M.-4:00 P.M.
A 2-day camp for cool kids entering 4th-8th grade. Classes include the library and library jobs, resources for homework help, Internet surfing and safety, movie-making, YouTube, carfts and more. Registration required and is already full. Update: We had so much fun! Check out the camp video posted on July 28, 2009. Tuesday, June 30, 2 P.M.
For ages 9 and up with some computer knowledge. Learn basics of Windows Movie Maker and how to upload videos to YouTube. Seats are limited. A ticket is required to attend this class. Free tickets are available at the Information Desk 1 hour prior to the event. Thursday, July 2, 2-4 P.M. Rated PG. Seats are limited. A ticket is required to watch this movie. Free tickets are available at the Information Desk 1 hour prior to show time. Thursday, July 9, 2-3 P.M.
Come watch three fun stories: “How the whale go his throat”, “The elephant child”, and “How the Rhinoceros got his skin”, presented by P&T Puppets. This puppet show will be held outdoors in the library’s patio. Some seating areas may not have shade. You are advised to wear a hat to shield the sun. Thursday, July 16, 2-3 P.M.
Join us for creative origami making. Presented by Christie’s Creative Cupboard. Young children must be accompanied by an adult. Seats are limited. A ticket is required to attend this event. Free tickets are available at the Information Desk 1 hour prior to the event. Thursday, July 23, 4-5 P.M. Presented by Amy and Friends Line Dance. For ages 3-103. Everybody can dance! Please wear sneakers or comfortable shoes. Young children must be accompanied by an adult. Thursday, July 30, 2-3 P.M.
Come watch videos made by you and your friends. Upload your home-made videos on YouTube to share with us. Find out details at the Information Desk. Tuesday, August 4, 2 P.M.
Magic+acrobatics+juggling+more. Dan and Kat are back with new tricks! Don’t miss it! This show will be held outdoors in the library’s patio. Some seating areas may not have shade. You are advised to wear a hat to shield the sun.